See the updated tutorials of using dhtmlxConnector with Codelgniter, Yii and CakePHP. 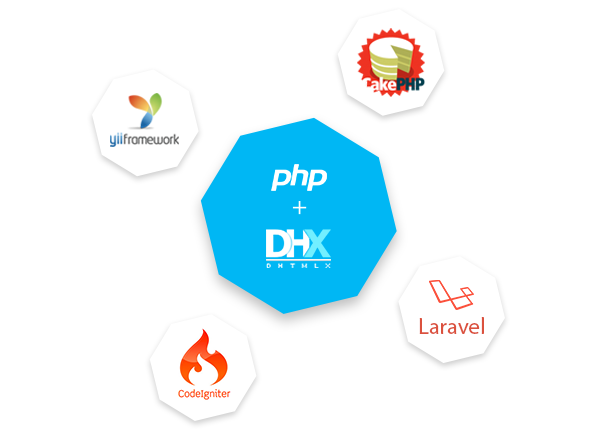 We’ve added the tutorial that will show you how to use the dhtmlxConnector library with the Laravel PHP framework. Following the steps of the new tutorial you’ll get a grid, a scheduler and a gantt populated with data from a database and able to save changes back to the server. You may download dhtmlxConnector from its page here, or install it through Composer and always have the latest version. When do you plan to release DHTMLX Scheduler 3.1? Jason, I’m not sure what did you mean. dhtmlxScheduler already has the version 4.3. DHTMLX Scheduler for ASP.NET has the version 3.3. Could you please clarify your question? Please help, i have installed the laravel_dhtmlx sample and use dhtmlx scheduler. Load data works fine, but i can’t save event to database. I switch from mysql to postgresql database..
Syaifur, do you have this problem only in postgresql database? Help please. I am trying to get the Spreadsheet to function. After the initial page where I set the DB and credential it goes to a blank page and does nothing. I am using MySQL as the back end and have tried this both on Apache2 (Linux) and IIS (Windows). Either one shows this issue. Hi to all, I need the sampleDB database. Because samples_grid table is not htere some other database. If we have this db that will be better. I just have to say that you have very poor documentations… There is almost everything, except for the main part on HOW to implement your software… Disappointment. Hi John, I’m sorry to hear that. We are always trying to improve our documentation. You may contact me at support@dhtmlx.com and we’ll try to help you with your problem. So which one you choose, pros and cons between those two. Many thanks for your assistance. Using dhtmlxConnector for integration can be easier as you don’t require any special knowledge. But if any error occurs it will be more difficult to locate and debug the cause of the problem. At the same time, direct integration is still not a hard task, so we can recommend you to use this way.